Author and illustrator Shirley Hughes is one of my favourites and her latest book, one of more than 200 she has created, is Daisy Saves the Day, the story of a scullery maid living in England at the time of King George’s coronation. When the story begins, Daisy Dobbs has a new job working for two elderly sisters, the Misses Simms. Daisy washes dishes, peels potatoes, scrubs the floor, and carries buckets of coal for the fires. It’s a lonely life for Daisy who has to live in the house where she works, and misses her mum and twin brothers. When she is offered the chance to borrow books from the house library, she jumps at it and is able to read in bed at night. The stories help her felt less alone. In celebration of the King’s coronation there is to be a special procession and lots of red, white and blue streamers everywhere. The Misses Simms are not impressed with the “vulgar” decorations, though and won’t have anything to do with them. Of course they will watch the procession, but their house will remain undecorated! When the sisters go out for the day, Daisy is stuck at home watching from high in her attic window. She decides to celebrate as well, and hangs odd pieces of red, white and blue washing from her window. Unfortunately, when the Misses Simms return they are not impressed and Daisy is punished. But then one day when she wakes to the smell of smoke, Daisy saves the day and rescues everyone. In return for her courage, and in recognition that she might not be in a job best suited to her, Daisy is given an amazing opportunity that could change her life. Daisy Saves the Day is filled with rich, detailed illustrations that evoke the time period, and for adults it’s also a story that may be reminiscent of TV programs like Downton Abbey. 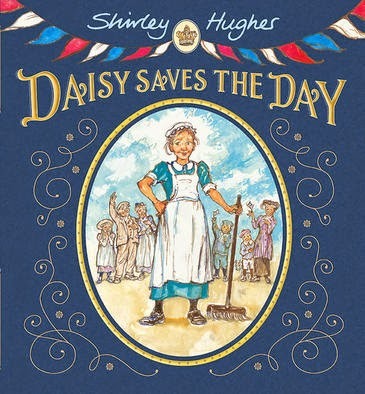 Shirley Hughes believes it’s important for children reading books to be “learning to look” and in Daisy Saves the Day they will be able to learn about the Georgian lifestyle, traditions, buildings and fashions. Even the endpapers offer a chance to learn about the times, with newspaper advertisements for things like a Bissell carpet sweeper, Cherry Blossom boot polish, and Watson’s ‘Argus’ Reflex Camera. To complement the book, there’s a great Daisy Saves the Day website with a behind the scenes video from Shirley Hughes, simple downloadable activity sheets, character introductions, and background information (including research photos and sketches). Be sure to check it out. Daisy Saves the Day is a beautiful picture book for sharing as a family or in a classroom.